Emily Dean has been chatting with royalty prior to our interview. She’s spent the afternoon at the Mayhew Animal Home, and has met the Duchess of Sussex (Meghan Markle, if you weren’t sure), the new patron of the north London based animal charity. “She asked me to show her a picture of Ray,” Emily says laughing, referring to her own dog. “I was desperately scrolling through my phone, trying to find a picture where he didn’t look weird, and it turns out he looks weird in all of them. It’s absolutely fitting that Emily should have been at this royal meet and greet. Her passion for our canine chums is something she wears with pride, today and in ‘Walking The Dog’, her hugely popular podcast for The Times. Each episode, Emily meets actors, comedians, and presenters, and they go for a dog walk together, while chatting about their lives, careers, and thoughts on their canine friends – occasionally interrupted by a pause to greet another walker or comment on the array of pooches in the park. Emily's book "Everybody Died, So I Got A Dog"
The podcast is always a funny and insightful listen. Emily never fails to delve deep into her companion’s backgrounds, and I wonder whether this is helped by the momentum of the walk? “It’s interesting, the conceit of the dog walk because you’ve got all those distractions, you’re kind of extracting thoughts by stealth. It’s misdirection in a way…” she pauses. Our interview, however, doesn’t take place over a dog walk (though we’ve both shared pictures of our pups – mine, Zac, a spirited rescue with a sparse feather duster tail; Emily’s, Ray, an inquisitive, much-loved Shih Tzu). While our mutual obsession with dogs will be a theme throughout, we’re also here to talk about Emily’s book, Everybody Died, So I Got A Dog. Emily has written all through her adult life. She was deputy editor of InStyle magazine for eight years, and has penned pieces for other titles including The Times, Evening Standard and You Magazine, and now also co-presents a Saturday morning show on Absolute Radio with comedians Frank Skinner and Alun Cochrane. However, Everybody Died, So I Got A Dog is all hers, and completely personal – firstly reflecting on her eccentric, extraordinary and bohemian childhood as a family unit of four (actor mother, broadcaster father, and older beloved sister Rachael). Emily explores the ever-changing dynamic between her parents, their glamorous gatherings while dodging of red-topped bills, her father’s academic outbursts, and her belief that other families were able to have dogs because they were stable and normal, unlike her’s. Her passion for dogs and pursuit of them, as well as the love she has for her ‘anchor’ Rachael, are the golden threads that run throughout her entire story to date. As the book moves from childhood to adulthood, Emily shares the devastating news of her sister’s liver cancer and death at the age of 43, less than a month after diagnosis. Her own experience of grief was compounded by the deaths of her mum and dad in quick succession, leaving her as the sole remaining member of her original family unit. To lose all your closest family over such a short period of time seems unimaginable. “It felt like no one had warned me, and with the nature of my family, it felt like they were bright lights that burnt out. A particularly dark period followed after her dad’s death, and Emily struggled to cope with her grief. She regularly saw her counsellor, Sue, and describes these sessions as “becoming a cocoon of comfort… like getting into a warm bath, where I could turn off the outside world and shed my skin”. To read more of Emily's exclusive chat with us, pick up the April issue of Happiful in supermarkets from Thursday 21 March. 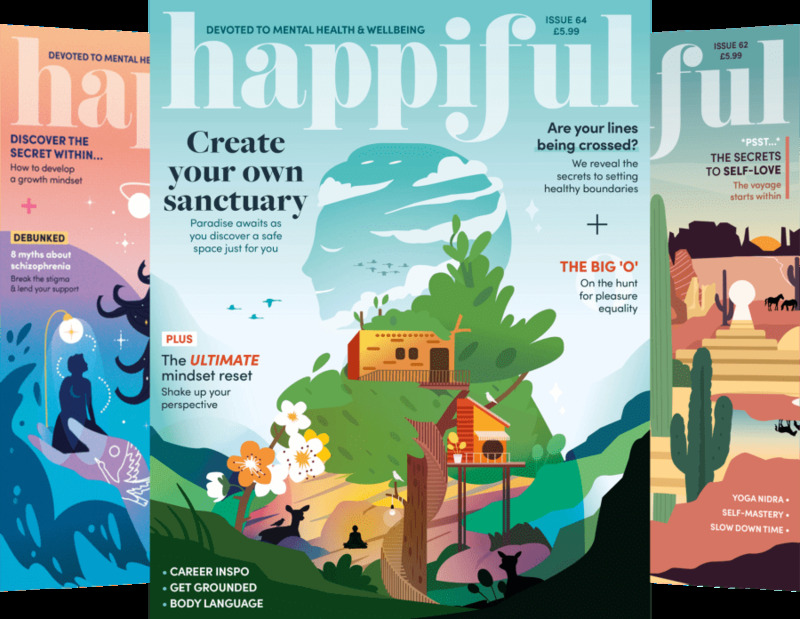 Online: Happiful is completely free to read digitally. To get our April issue in your inbox this Thursday, subscribe now.